PARK CITY—A new year is upon us, and many of us start to think about changes that we’d like to make in our lives. Sometimes change is difficult, and sometimes people just can’t change. Old habits die hard and, unfortunately, old wrestlers die easily. 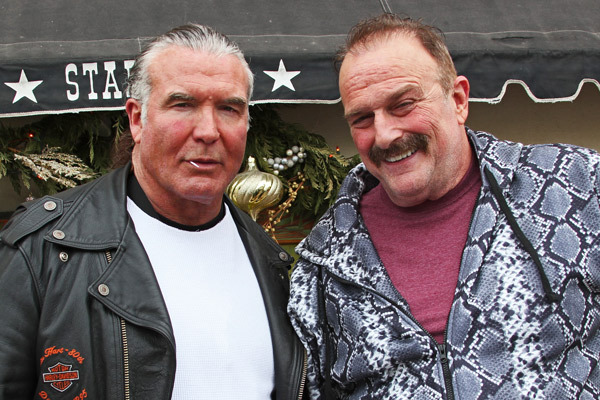 Scott Hall and a resurrected Jake the Snake at Sundance. Over the last 10 years, 38 high-level professional wrestlers have died, including such household names as The Ultimate Warrior, Macho Man Randy Savage and the Earthquake. When former World Heavyweight Champion Diamond Dallas Page got word that his friend and mentor, the legendary Jake the Snake, was quickly approaching adding his name to that list of deceased wrestlers, he chose to take aggressive action. In “The Resurrection of Jake the Snake,” Director Steven Yu delivers a raw, revealing look into a troubled life. Jake’s ring mastery and captivating microphone skills made him one of the best-known “faces” and “heels” within the top tier of professional wrestling. But, like many wrestlers, after injuries mounted and a star that burned brightly began to fade away, reality was difficult to deal with. Once retired, Jake, like many who retired before him, sought to keep the adrenaline alive inside of him through whatever means necessary. Drugs and alcohol tore at his family relationships and his physique, finally rendering him down and out, alone in a small home off of the highway, overweight and coping through whatever bottle was available. Fitness guru and wrestling legend “Diamond” Dallas Page received word of Jake’s condition in 2012 and convinced Jake that a change in life was necessary in order for him to be happy. The majority of the movie chronicles what happens over the ensuing months as Dallas moves Jake into his own house (aptly nicknamed “The Accountability Crib”) in an attempt to help Jake get in shape, stay sober and mend damaged relationships with his children. Along the way, shocking revelations are given by Jake in how he let himself slip so low. The tough reality of these moments and the way they manifest themselves are something that even the best wrestler in the business couldn’t pull off. This show is gritty, and the demons are very real. Jake’s fight to reclaim his life is a painful but liberating journey that shows the difficulties of battling substance abuse and getting back into healthy physical shape. Many wrestlers share perspectives, including Stone Cold Steve Austin, Chris Jericho and Scott “Razor Ramon” Hall. Hall himself was in a dark psychological place not far from the one which Jake suffered, and he ends up coming on board with Jake and Dallas, which turns into additional motivation for Jake. With Scott along for the ride, life at the Accountability Crib is in full swing. While wrestling has been known for cheesy, clichéd promos and child-motivating monologues, the encouragement that Dallas gives to these fallen heroes is heartfelt and sincere. His constant efforts to help them right themselves magnify his overwhelmingly positive attitude, which is one of the true motivating factors that keeps the fight alive between the wrestlers and their addictions. The self-belief that Dallas helps them find along the way is very genuine. Dallas’s treatment of Jake and Scott is akin to a loving brother, and ultimately, it is the power of family that will have the potential to bring about the biggest change in these legends. This is a film that transcends wrestling, and can be universally appreciated for the important themes that it represents – hope, persistence, friendship, love and family.